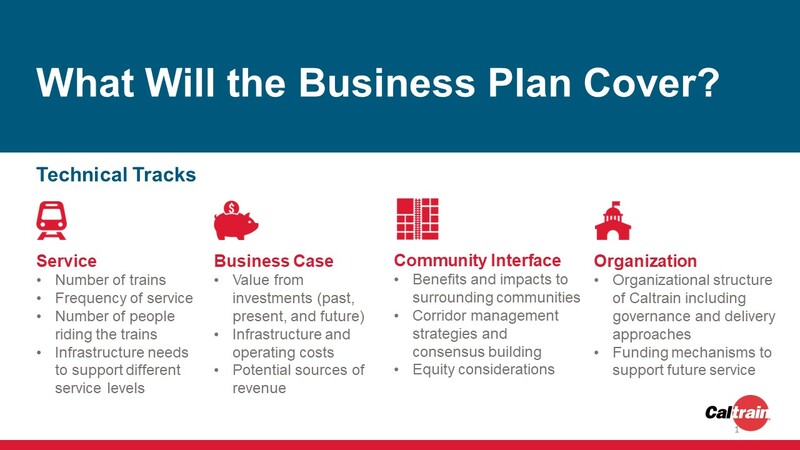 Learn more about the Caltrain Business Plan by viewing the resources below. Resources can be sorted by the four areas of the Business Plan if you’d like to learn more about a specific element of the plan. Scroll down for the list of resources, or, click on one of the four focus areas to see resources specific to it. This presentation will be given in early January 2019 to the Caltrain Joint Powers Board. It provides an overview of the service planning process and community outreach to date. This memorandum of understanding is a technical document that outlines the roles and responsibilities of both Stanford and Caltrain in the development of the Caltrain Business Plan. The attached scope of work provides a high-level understanding of the tasks included in the Caltrain Business Plan. Elements of this scope are subject to modification as the project progresses. This presentation presents service planning and ridership forecasting progress through March, including terminal planning and forecasting under the different growth scenarios. This presentation presents service planning progress through February, including draft service levels for analysis under baseline, moderate growth, and high growth scenarios. It also includes next steps for service planning, costing, business case analysis, and community interface & outreach. This presentation presents service planning and community interface assessment progress through December, including draft service recommendations, off-peak and weekend service, and South San Jose and Gilroy planning. This presentation presents 2040 market demand and service planning progress through November, including a comparison of different service approaches. This presentation was given in the beginning of October 2018 to the Caltrain Joint Powers Board. It provides an overview of the Business Plan. This presentation presents service planning progress through September, including a summary of existing ridership trends. This presentation introduces the service and community interface focus areas of the project. This presentation provides an overview of the Business Plan and introduces the challenges and opportunities of the project. Interested in downloading any of our project graphics? Right-click the graphics to download.